This past week Veasna, 39 years old, accepted Christ as his personal Saviour. He lives in Prak Pnou village which is about 13 miles from the church. Beginning next week I will start meeting with him each Tuesday morning at 10:00 for personal discipleship. It was a blessing to see him here at church this morning. He has a Vietnamese friend named Oak who is interested in knowing more about what Christians believe. I’ve been able to meet with Oak twice now to discuss what it means to be a Christian. 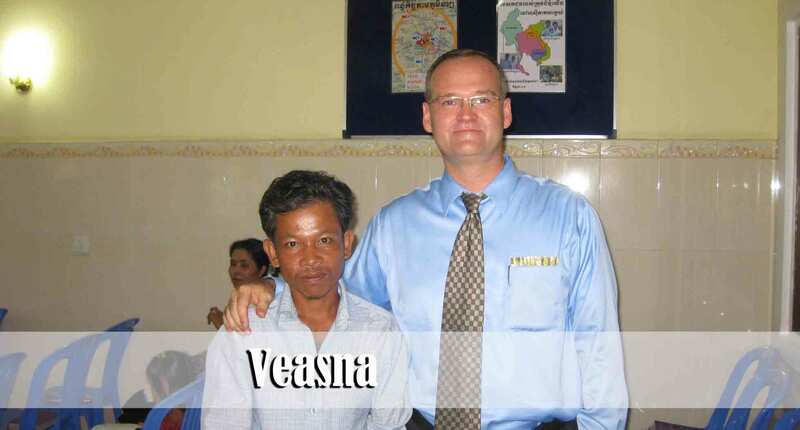 Pray with us that Veasna will be a good testimony in front of Oak and that he will also come to know the Lord very soon. Oak is 42 years old and is fluent in Khmer and Vietnamese. His wife is totally deaf due to an accident that took place during the war many years ago. She does not speak any official sign language and so we are a bit perplexed as to how to go about reaching her with the gospel. Hopefully Oak will be able to adequately communicate with her about the Lord when the time comes. Last week there were two other professions of faith in Prak Pnou village. Please continue to pray about getting a church started in that village. Each Tuesday and Saturday morning I meet with Grandma Sooan for about an hour and discuss the things of the Lord at her home in Prak Pnou. (I introduced Sooan to you in the update on 3-10-13.) 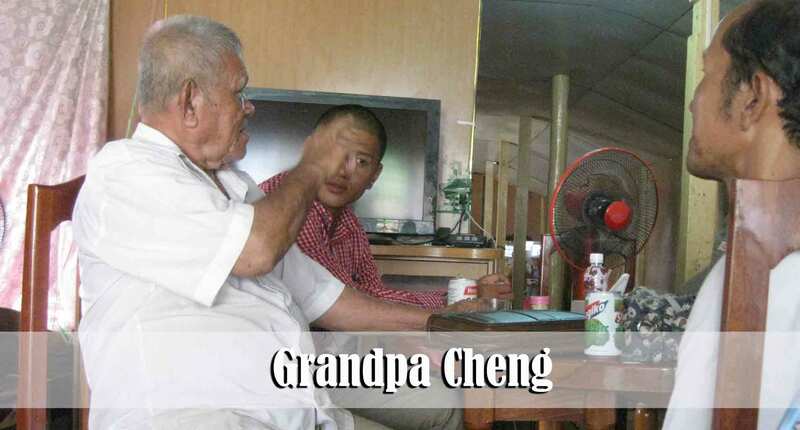 Most of the time her husband, Grandpa Cheng, does not stay in the house to listen to what I am saying. He claims to be a staunch follower of Buddhism. Yet, he is very supportive of Sooan and her decision to follow Christ. He reminds her every Tuesday and Saturday morning to stay home and wait for me to arrive to teach her. Last week he told her that she needs to make sure that she follows everything that Jesus wants her to do because he does not want her to be a hypocrite. It was a blessing that this past Saturday he sat in the room and listened as Brother Sinath, Brother Sovann, and myself taught Sooan the Word of God. We are hoping that he is opening up to the gospel and will soon be saved. Please help us pray that God will use the things that he has heard and that he will respond to the light that he has been given. For the past two or three months Oudom has been missing from church. He used to live next door to the church but last year his family moved about 45 minutes away. His phone number was changed and no one knew how to get in touch with him. Jeremy has been praying for some time now that he would return to church. It was a huge blessing to see him show up this morning having ridden his bike 45 minutes from his home out past Chba Umbo village on the outskirts of Phnom Penh. Please pray that Oudom will continue to come to church. 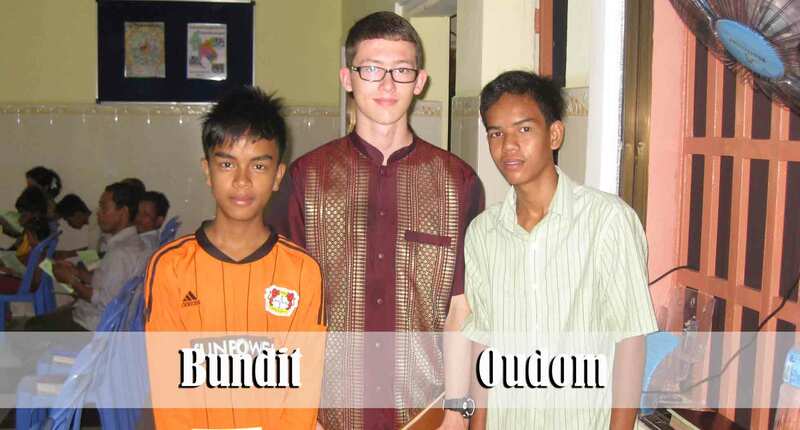 Bundit and Oudom were friends before Oudom moved so far away. Bundit is very faithful to nearly every church service even though he has to ride his bike 30-40 minutes one way in order to get to church. 2 Timothy 2:2 “And the things that thou hast heard of me among many witnesses, the same commit thou to faithful men, who shall be able to teach others also.” One of the major responsibilities that missionaries have is not just to win folks to Christ but to find faithful men and train them in the things of the Lord. About 7 weeks ago I hand-selected six of our men and asked them to be a part of a new accountability group that I wanted to start. One of the requirements to be a part of this group is that they had to have already become a “faithful man.” I could have chosen a number of other men who are equally faithful to the Lord, but because we wanted the group to be small I had to stop with these six men. Another requirement to becoming a part of the group was that each man had to be willing and able to take the things that he is learning and teach them to someone else during the week. We are very thankful for each of these men and their families. They have each taken a strong stand for the Lord. Some of them have endured serious persecution because of their faith in Jesus Christ. Five of these men have been saved over the past two years here at Pacific Baptist Church. I had the privilege to lead the sixth man to Christ approximately 7 years ago. I want you to know their names so that you can pray for them as they are seeking to live for the Lord. Starting from left to right their names are as follows: Sinath, Ra, Taiwan, Vannak, Kam, and Hem. Three of these men are Khmer and three are Cham. Three of these men are already preaching in various services each week and are doing a fantastic job. We thank God for each of these men and count if an honor to be able to be a part of their lives. We meet together each Saturday from 4:30 p.m. until 7:00 p.m. – or whenever we get done. This past week Debbie had the joy of beginning Phanuth on piano lessons. He lives in Prak Pnou village and is a relatively new believer. He comes from a very musical family. 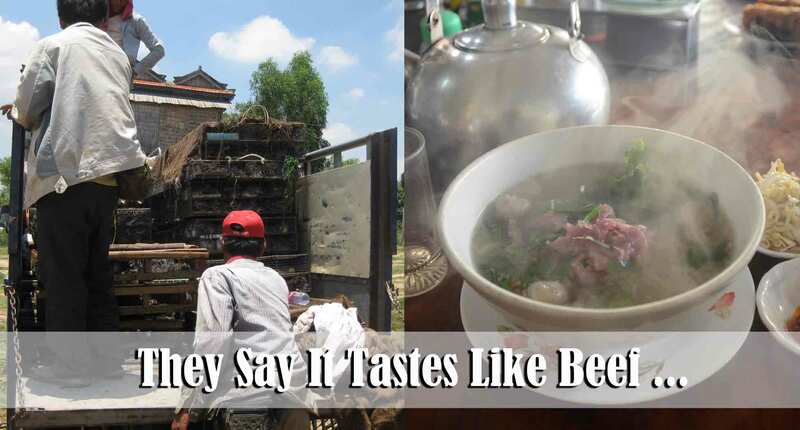 In fact, his father was a four-time winner of a national singing contest here in Cambodia. 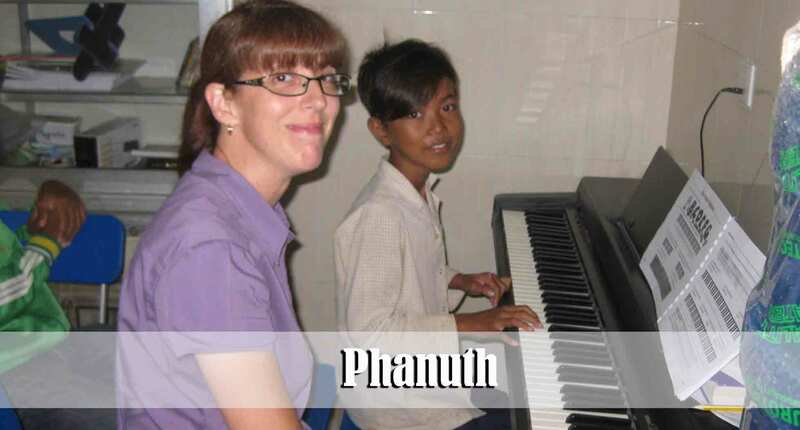 Phanuth’s parents desire that he be trained to play the piano so that he can play for church. God has given him a natural talent for music and we expect that he will excel as he follows Debbie’s guidance. In addition to Phanuth, Debbie is currently teaching Jason, Srey Nik, and Bundit the piano. Lord willing we will have several new piano players in the future ! It is often very humbling to serve the Lord in a third-world country. The majority of the folks who are reached are from, at best, very modest means. One of the poorest ladies in our church brought us a big bag of these cucumbers a couple of days ago. Today she showed up with two more bags of vegetables. These mangoes came from a new Christian lady who is 70 years old. It is humbling for us to accept these gifts from people who barely have enough money to live from day to day. 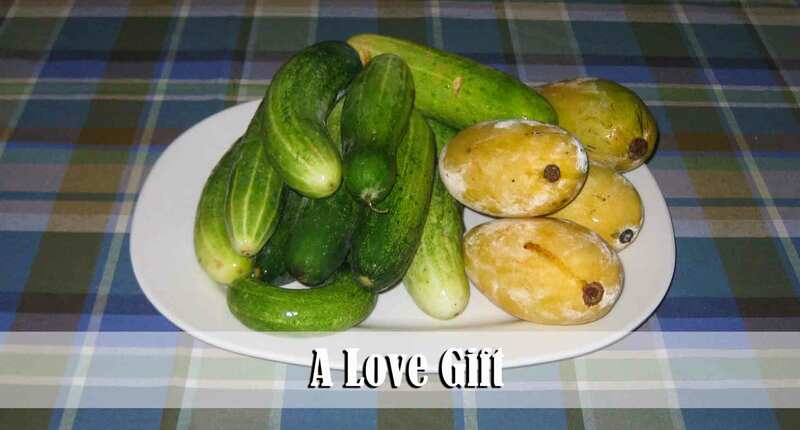 The lady who gave us the cucumbers did so out of gratitude for some Christian music that we were able to give her last week on mp3. The grandma who gave us the mangoes did so out of gratitude for us taking her the gospel so that she could be saved. She told me that she has lived her entire life trying to do good deeds in order to pay for her sins. She is so overjoyed to know that Jesus has already paid the price for her sin and that she has a home in Heaven. Thank you for doing your part in helping to pray for and invest in the people of Cambodia. You are making a difference ! This week we will, Lord willing, have the roof put onto the building in Prey Bang village. (Arrow # 3 on the map https://goodnewsfromafar.files.wordpress.com/2013/04/4-28-map.jpg ) At the beginning of next month we plan to take up a special offering in order to purchase the bricks to construct the walls. It is very important that the national believers each get involved in sacrificing for this project. Each brick costs 130 riels (about 3 cents). One hundred bricks will cost about $3.25. The vision has been cast for each man, woman, and child to do what they feel God would have them to do. 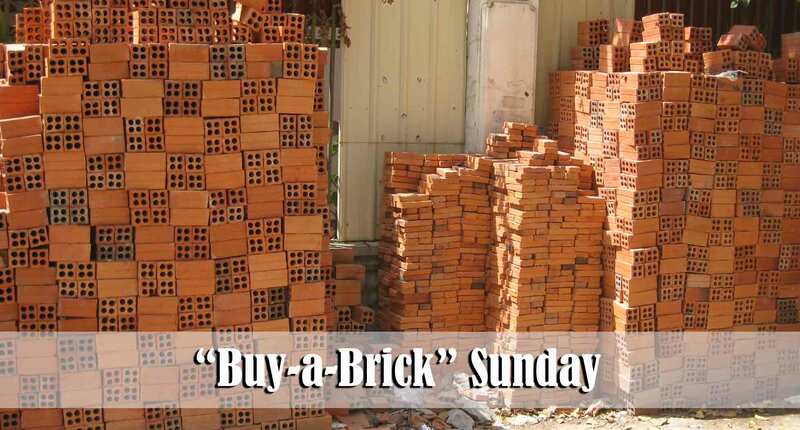 I have encouraged each adult to ask God to allow them to purchase not less than 100 bricks. No doubt some will be able to purchase 1,000 bricks. We plan to take up the offering on June 2nd. Please pray that the people will allow God to stretch their faith through this special project. This year we are really focusing on training / discipling leaders. There are two primary reasons why: 1) It’s Biblical, and 2) There is so much work that needs to be done and so many open doors in this country that we MUST have more qualified laborers if we are going to be able to go forward and see souls saved and churches planted. We must have more men who can preach and women who can teach. As the Bible Institute expands we believe that we will continue to see folks grounded in their faith and able to help bear a portion of the ministry. In the English speaking world we often take for granted all the Christian training materials that are readily accessible. 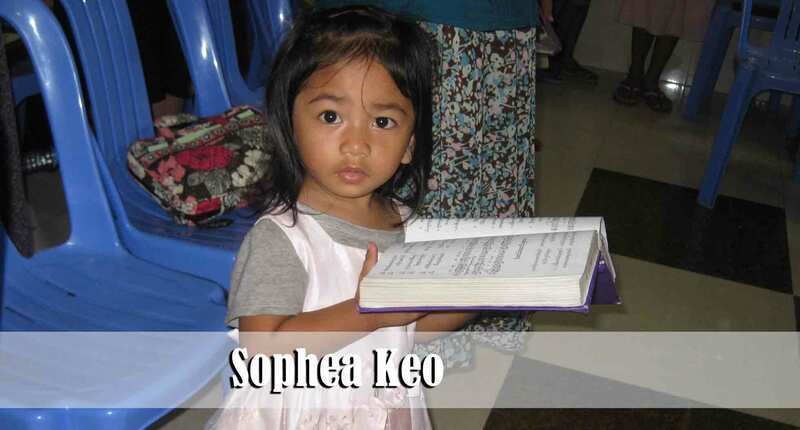 However, it is difficult to find doctrinally sound materials in the Khmer language. 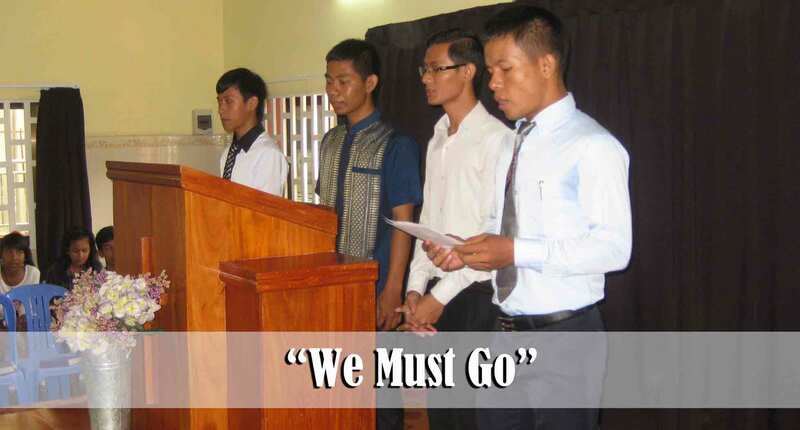 We, and other Baptist missionaries, are working on producing materials but we still have a long way to go. 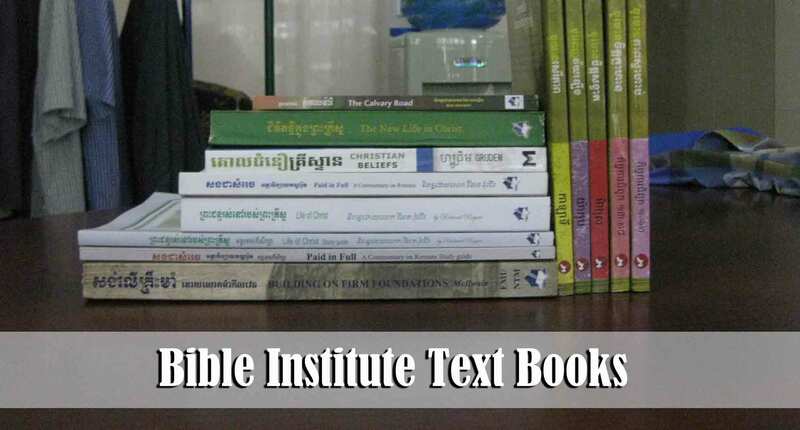 We have chosen to provide the Bible Institute students with these 13 books in the Khmer language. I do not necessarily endorse 100% of the material in these books but we are thankful for the fact that they are available. We are also grateful for Pastor Hannahs and Fellowship Baptist Church who made the purchase of these 260 books (20 students x 13 books) possible through a special gift that they gave us. The Institute students will only need to pay a very small fraction of the actual purchase price due to their generosity. 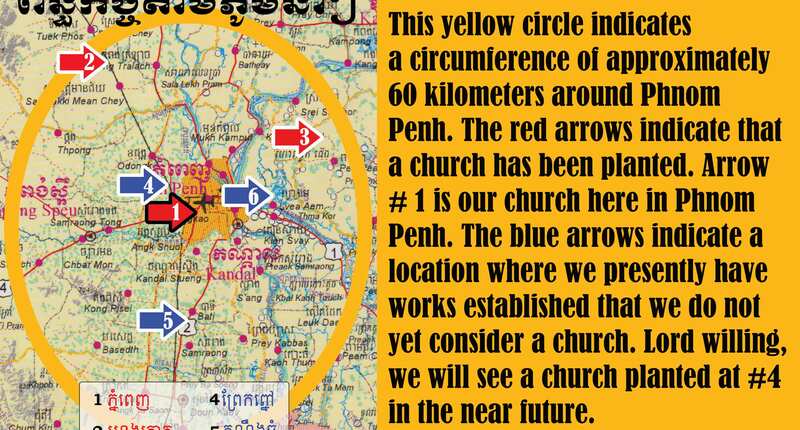 1) A month from now we hope to begin a new soul-winning outreach to the remote homes situated just past Prak Pnou village all the way to Prak Kdawm village. These homes stretch along the main highway for about 20 kilometers. Some of the homes are close to each other but for the most part the houses are spread out. It is my guess that the majority of the folks who live in those homes have never had a soul-winner come to their door. This new ministry will be called “Highways and Hedges.” Please help us pray that we will be able to make good contacts through this endeavor. We hope to have 40 soul-winners participate in this one-day outreach. Towards the end of this month we hope to print a special tract for this outreach. 2) This week we are beginning the work on a 6 month project of writing daily devotionals to be used in all of our ministries beginning in January 2014. There are many materials available in English but that is not so in Khmer. We presently only have, to my knowledge, one set of 12 monthly devotional lessons that is doctrinally sound and in the Khmer language. These were produced several years ago by Bro. Benefield and the folks who are a part of their ministry and we will continue using those lessons through the end of this year. This project will be very time consuming but we feel that it is a necessary tool that can help new believers grow in grace and in the knowledge of the Lord Jesus Christ. (2 Peter 3:18) Please help pray that this project will go forward without glitches. I have asked 7 of our men to help with this project. I could not resist taking this picture of Sophea this morning during the song service as she stood in the front row trying her best to fake singing ! Many of you prayed for her when she was prematurely born weighing only 2 pounds just 27 months ago. She is definitely a miracle baby !